Rumble Resources Ltd (ASX:RTR) today announced it has signed a binding option agreement to acquire the Nemesis high-grade gold project, which comprises 141.6 hectares of tenements 40 kilometres north of Cue in the Murchison Goldfields of Western Australia. The company recently added the Earaheedy high-grade zinc project and the Munarra Gully high-grade copper gold project, and is now adding the Nemesis project to its portfolio. All of the projects will be drilled tested this calendar year, along with the RTR’s Fraser Range projects (being drilled by the company’s JV partner IGO). With so much exploration happening at once, RTR’s shareholders could see multiple near-term share price catalysts should any of the programs make high-grade discoveries. Nemesis was mined for gold from 1900-1910, and produced 7157 ounces of gold from 2276 ton of ore — 98 g/t gold grade. The Nemesis Shear Zone that hosts the Nemesis gold mine is prospective for mineralised strike and depth extensions with potential to host high-grade shoots similar to the Nemesis ore body. Previous drilling campaigns focused on defining shallow oxide mineralization, and as a result no drilling has tested the depth extension of the Nemesis deposit below 40 metres. 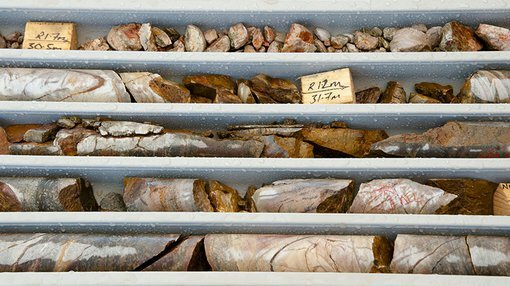 The Nemesis Shear Zone also contains near-surface laterite/saprolite mineralization, and the northern portion of the tenement contains a series of high-order gold in soil anomalies. Most of the project covers land over a prominent lateritic plateau, which rises some 35 metres above the general topography. An east-west trending mineralised shear zone forms the boundary between the north sequence of mafic volcanics/BIFs and granites to the south. During the option period RTR plans to undertake several drilling programs, circa April 2018, which will target high-grade gold lodes at the Nemesis mine area. 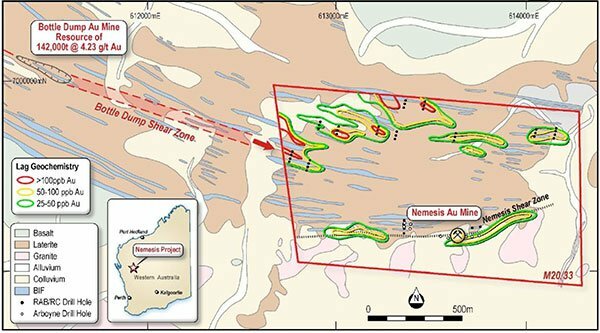 Having inspected the Nemesis u mine and the nearby Bottle Dump mine, RTR has identified that the high-grade gold mineralisation is associated with steep east-plunging shoots within steep north-dipping shear zones. Previous prospectors targeted the shallow strike gold mineralisation along the shears as opposed to the high-grade dip length extensive shoots. RTR intends to map out the plunge extent of the known mineralisation to generate drill targets in the near-term, and subsequently fast-track RC drilling of identified targets.